Don't let the air in your home make you sick! As many know, certain seasons come with allergies, itchy eyes and runny noses. Fun! But experts stress, not all of these symptoms are caused by pollen. In fact, the air quality in your home could be causing these annoying ailments. Did you know that the EPA says indoor air is generally more polluted than outdoor air? Thankfully, cleaning air isn't complicated. TODAY Home spoke with environmental scientist Dr. Ted Myatt and indoor air-quality expert Dr. Elliott Horner, who's with UL, an independent safety science company. Before you run out and buy an air purifier, Horner explains that there are steps to take first. “In order for a room air cleaner to have a chance of reducing the levels of particulate matter (PM) in a room, all sources of PM that can be removed should be removed,” he said. 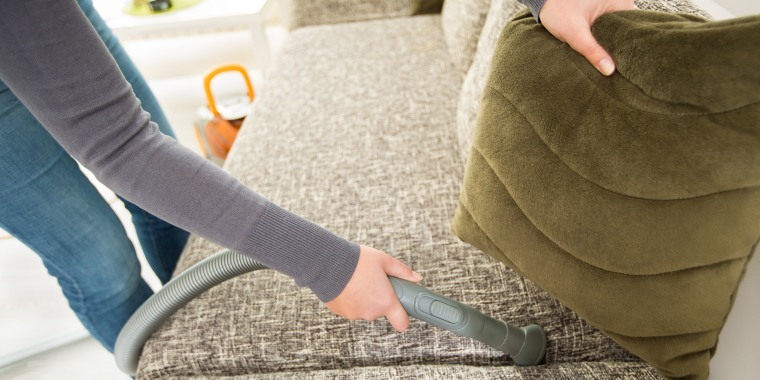 Remove carpets, drapes, plush toys and anything else with a fuzzy surface. Dust frequently and minimize dust-gathering clutter. Vacuum floors and carpets often, using a vac with a HEPA filter. Vacuum mattresses every two weeks, use allergy-proof mattress covers and wash all bedding in hot water every week. If pet dander bothers you, keep pets out of the bedroom. Limit the amount of burning candles and wood fires in the home. The top air polluter in the home is cooking with natural gas or at high temperatures in the oven or range, said Horner, so always use exhaust fans that vent outside. No exhaust fan? Open a window and use a small fan to move air outdoors. Run the fan in the "auto" mode when using the A/C. Continuous "on" operation of the fan will raise the humidity and may lead to mold growth. Don't store chemicals, solvents, glues or pesticides near your living quarters. Provide good ventilation by opening windows occasionally in rooms with electronic gadgets (TV, toaster, computer, etc.). According to Horner, the heat they generate reacts with adhesives and plastics inside the product and can release toxic chemicals. Allow new foam pillows, mattresses or mattress toppers to sit in a well-ventilated room per manufacturer’s instructions. Upholstered furniture and carpet/rugs that are treated with a flame retardant also require extra ventilation. After taking these proactive steps, you can use an air purifier to remove much of the remaining pollutants. Check out our list of the best air purifiers to try now, according to doctors. This article was originally published on Oct. 6, 2016.